Subconscious. Since then I have been trying to break out of my creative fixation to explore the figurative styles once again. Still lives and studies of figures have been the avenue I’ve been trying to explore recently, along with new and interesting mediums and technologies. 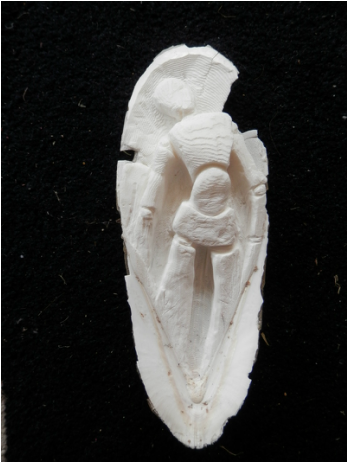 I have invested in a 3d pen and I have been carving using the washed up backbones of cuttlefish. Since my move to the coast my exploration has had a nautical theme, so look out for a lot of drawings of dead birds and other sea creatures. I know it’s gross, but I can’t help it. 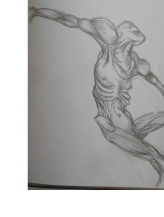 A figure forming out of some kind of organic material. it was just a doodle while couldn't think of anything else to draw. My organic recreation of the subconscious landscape is my fall back style. 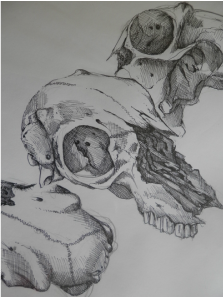 It originated from drawings I did when I was in high school. They were easy. I found it was very automatic for me, I would relax and let my hand make the image. When painting there is obviously a little more preparation, but it was a similar process. I became a habit. When I was at university I would revert back to it whenever I was feeling defeated or uninspired. It then began to form the backbone of my portfolio. This inspired me to explore the work of the surrealists and automatic drawing. This kind of draw can't all be totally automatic, it sprouted from my passion for plants and bone, even the muscles and internal organs of animals. These became a shifting blend that would form floating organisms, lattice-like landscapes and thus my subconscious landscape was born. It was this artwork that inspired the 'Metaphysical Plane' That my character Athan visits in my book series The Post-Humans. But I will discuss this more in The Post-Humans section. Dried head of a kelp wrasse. I found the mouth to be extraordinary. It could be a nightmare creature. It may be a cliche, but the ocean can be a never ending supply of resources and inspiration. My fascination with the detail in death has been a little hard for some people to stomach, but when you start drawing objects from the ocean everything seems to be ok. They are still bones! It doesn't matter to me. I have to take constant adventures to parts of our local wild coastline to find objects that I can draw. My favourite so far are my collection of skulls from local birds. It may be creepy, but I find them beautiful. So far I have two albatross skulls, a gannet, three shearwaters and a petrel. I doesn't mean a lot to most people, but when I draw them on a large scale in pencil their curves and structure are simply amazing. An abalone shell. Nothing special, but it was the first time I'd played with gouache in years. 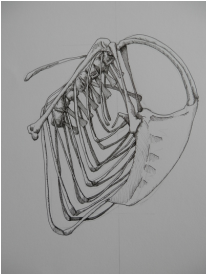 This is the torso section of a small petrel. It was beautiful and delicate. A dead sea dragon. I was using one of the blue pencils that comic artists and story boarders use. Carving into the foam-like back bone of a washed up cuttlefish was something i had thought about doing for quite some time, but I refrained because of the fragility of it. After moving to a seaside destination though i found myself with an endless supply of these. They are incredibly soft, yet at the same time they can be challenging to carve. I think that they are a fine way to practice this kind of sculpting. I think it is also a great way to explore the figure. the softness of the medium enables you work quickly to produce soft curves and intricate details. I have been stockpiling quite a lot of larger specimens for future carving, so you can expect to see some of my experimentations on here in the future. The carve into this medium you could use any kind of sharp household tools, but I use a range of items from my sculpting kit. These can be bought cheaply online. they give you a wide range of points and spoon tips for creating a wide range of realistic detail. The sculpting kit shown on the right. Varied points, angular and curved, also some of my epoxy resin that I will by trying out on some later projects. Still Life one of the oldest themes for drawing. It doesn't get any less beautiful. It is the best way to learn any kind of observational skills and how to utilise the elements of art. You can use any medium you wish but pencil and charcoal always give that authentic look. Plus they rub out when you aren't happy with your drawing. I don't think schools or university put enough focus on the importance of still life drawing. I probably don't do it enough, but I try. Well it is hard to find time and space to draw or paint these days, but I have every intention of exploring new visual ideas and putting some of the images on here so you can see. Seeing I haven't done a lot of late, I thought I'd put a few images up. 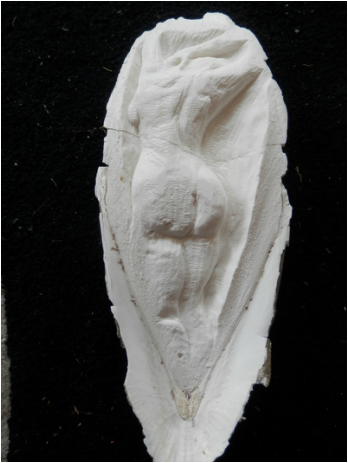 Firstly there are some pictures of a few of my experimentations with the cuttlefish sculptures. I have plenty more to play with, so I'm not fussed about them breaking or not working out. I also thought I might show you a couple of the drawings that helped inspire 'The Post-Humans' books. There are a lot, in fact most of the drawings I have done since high school have contributed to the construction of the metaphysical landscape that Athan is connected to.